Tom Vowler’s second novel, That Dark Remembered Day, opens with what could be a recurring nightmare: a boy on the cusp of young adulthood gets off the school bus in Spring 1983, full of hope and fuzzy expectations and, on his way home, walks into something that quickly shatters that child’s happy innocence forever. The book then fast-forwards to Autumn 2012 and Stephen, a grown man with a family of his own and a job that stems from one of his passions. Unfortunately, unresolved anger issues and drinking are jeopardising everything: he’s been suspended from his job and his wife has told him that they can’t go on like this for much longer. Things appear to be quickly unravelling when he gets called back to his home town. He’s avoided going there in the past but now it seems as if he must return, not only to see his mother who’s unwell, but also finally to see if he can deal with what happened there in 1983. One of the reasons this book works so well is because Tom Vowler manages to sustain the suspense for so long. The reader deliberately isn’t told what the tragic event was until quite late on in the book and so can only guess at what happened, or how, and tweak their ideas each time they’re drip-fed further information. The slow reveal is brilliantly done and left this reader with just enough new information each time before another layer of the story was peeled away to reveal the next one. Even when I thought I knew what had transpired, it turned out that I didn’t have all the details and still needed to adjust how I was looking at things, when more was revealed. I found my attitudes towards the characters and their place in the story continuously shifting, which made for both a compelling and unsettling read. Suspense is also heightened thanks to the way in which the novel is structured. It’s split into four parts: the first and last are told from Stephen’s perspective in 2012, while the two middle sections go back to the summer of 1982, and are told by Stephen’s mother and father respectively. All the narrators tell their stories in third person, which both helps the reader get into the mind of each different narrator and shift perspective while also maintaining some distance from them. The characterisation and descriptions of place are excellent. This four-part structure also effectively allows the story to be told in reverse, say, to how most of us would normally hear about it, if it were a real event and reported on the news. Any news report would start with the shock event and subsequent bulletins would then work backwards from that filling in the detail. That the novel builds up to a detailed account of the event, gives it all the more impact. I found the last section absolutely chilling but also extremely moving and it has stayed with me months after finishing the book, which ultimately left me reeling with much to think about. That Dark Remembered Day explores not only how a tragic event plays out in a small town but also, and perhaps more interestingly, what life is like for some of those closely involved in it, both in the months leading up to it, during the event itself and in the aftermath. It is a taut, brilliantly written novel, with layer upon layer of suspense, dealing with important psychological issues and challenging the reader’s views as they put themselves in the shifting positions of the story’s characters. That Dark Remembered Day is an assured novel by Tom Vowler and a worthy successor to his collection of short stories, The Method, and debut novel, What Lies Within. He’s an exciting writer to read and I have no hesitation whatsoever in recommending him to you. Many thanks to the author and Headline for sending me a review copy. I’ll be buying my paperback copy and getting it signed later today at the Waterstones Drake Circus, Plymouth launch. 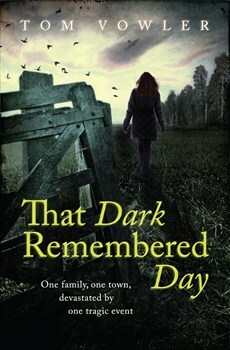 That Dark Remembered Day is Tom Vowler’s second novel and is out today in paperback. It is published by Headline Books and is available from Amazon UK, Amazon US, The Book Depository, Hive and Waterstones. To find out more about Tom and his books, check out his Author Website or Follow Tom on Twitter. Tom will be visiting this blog on 31st July. Be sure to come back for that!